A scientist in his laboratory is not a mere technician: he is also a child confronting natural phenomena that impress him as though they were fairy tales. Marie Curie’s quote offers an apropos guide for Dr Louisa Preston’s book. 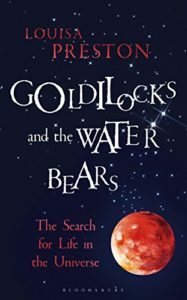 In Goldilocks and the Water Bears, astrobiologist and planetary geologist Preston tackles the science of astrobiology, a science that “has yet to prove its subject matter exists”. Us ing the latest discoveries, Preston takes readers on a lively tour of the search for life in the Universe, its many potential forms, and the challenge for its detection in the Solar System and beyond. Like the spiral arms of a galaxy, microbiology, astrophysics and geoscience converge to form the core of astrobiology, and the book benefits greatly from Preston’s ability to navigate with ease between scientific fields. Further, her rigorous approach that both question and inform the reader makes this book a must read by professionals, graduate student or science enthusiast. The book examines the main themes that underpin modern astrobiology, from planet formation and habitability, the potential building blocks of life and their delivery to planetary surfaces, to the hunt for extrasolar planets and alien civilizations. All these themes are tied together by a common thread: what defines life, and how to detect it? A strength of this book is its emphasis on the importance of Earth as the key playground for Astrobiology. The quest for Life in Universe is bound to its appearance on Earth; it is where Life’s adventure started and figuring out how is Astrobiology’s central quest. Earth has astonishingly adapted lifeforms that thrive in extreme settings (extremophiles) and it is these that many researchers envisage might have been, or are, present on Mars, Europa or Titan. The book provides a measured assessment and description of the limitations of those plausible analogues as habitable environments beyond Earth whilst detailing how future space missions are dependent on insights and findings of such environments here on Earth. Far from being a terse compilation of science facts, Goldilocks and the Water Bears offers a far ranging tale, and the book — as Science — is nothing short of fantastic. It’s no surprise, then, to title the book after the microscopic heroes of survivability, the real but yet undefeatable Water Bears, a perfect reminder that life is a pathfinder. It’s also pure logic to introduce the pertinent ‘Goldilocks Zone’, (what scientists refer to as the Habitability Zone), the region housing the conditions thought to be the most suitable for life. Equally, the underlying sense of wonder of the narrator combined with the splendid (but yet scarce) illustrations also give the narration a true sense of the epic.